Some aggrieved members of the All Progressives Congress (APC), who fail to withdraw their court cases instituted against the national leadership of the party over the outcome of the party’s primaries, may be expelled. The National Working Committee of the party may have thus ignored President Muhammadu Buhari’s stand on the festering crisis. Buhari had on Monday submitted that the aggrieved APC members had the right to seek legal redress over the results of the primaries. The National Vice Chairman of the APC, South-South, Chief Hilliard Eta, gave the hint in an interview with The Punch. Buhari, in a statement last week, said members of the party, who were not satisfied with the outcome of the party primaries conducted across the country, were right to have approached the court to seek redress over the alleged unfair treatment. The President faulted the position of the NWC of the party, which asked aggrieved members to withdraw their court cases or be ready to face sanctions. But Eta said many of the aggrieved members currently in court over the results of the party’s primaries did not exhaust the party’s dispute resolution mechanisms before rushing to court. He said the party would not change its position on the issue, insisting that it would sanction errant members, which might include expulsion for failing to explore Article 20, subsection 10 of the APC’s constitution. He said, “We need to juxtapose the President’s utterance with the position of the party. The constitution of the party states that you must exhaust all internal party conflict resolution mechanisms before you seek redress in court. When reminded that the party’s position contradicted the President’s pronouncement on the issue, Eta said, “The President is a loyal party man and if that provision of the constitution is brought to his notice, I am very sure that he is going to abide by the constitution of the party because the President is the man who will always stand on the side of the rule of law and that is the rule of the law of the APC. “I can tell you categorically that most of these aggrieved members did not exhaust the internal conflict resolution mechanisms before approaching the court. Take the Cross Rive State’s case for instance, at no time did the Minister of Niger Delta Affairs, Pastor (Usani) Usani, exhaust the internal party mechanisms before going to court. Eta added, “In most of the states, aggrieved members abandoned the internal party mechanisms and proceeded straight to the court. Also, the Deputy National Chairman (South), Otunba Niyi Adebayo, argued that Buhari’s statement did not contradict the position of the NWC. Adebayo, a former governor of Ekiti State, submitted that members of the party must explore all avenues to resolve internal conflicts before heading for the court. He stated, “I believe the President’s statement is in tandem with that of the National Working Committee. He is absolutely right that nobody should be denied the opportunity of going to court if he feels aggrieved. It is not the intention of the NWC that people should not be allowed to go to court. Also, the factional chairman of the APC in Delta State, Chief Cyril Ogodo, said his faction was unperturbed by the fresh threat by the Adams Oshiomhole-led NWC to expel aggrieved members who failed to withdraw their suits against the party. 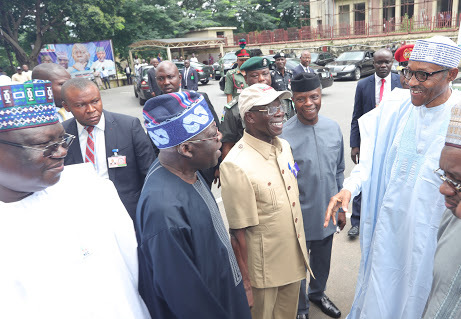 Ogodo, who was inaugurated by the then National Chairman of the APC, Chief John Odigie-Oyegun, before Oshiomhole’s NWC ousted him, said his group would go ahead with the case. He told The Punch on Saturday that he would pursue the case to its “logical conclusion” until the Delta APC was served justice by the national leadership. The chairman, who enjoyed the backing of the state leader of the party, Olorogun O’tega Emerhor, Chief Hyacinth Enuha and several of the governorship aspirants in the state, added that the faction would act in line with the position of Buhari. He added, “Like I said before, I’ll pursue my case to its logical conclusion. However, I have taken advantage of the purported reconciliatory committee the NWC has set up. If justice is served by that committee, there will be no need pursuing the case further.